﻿ Why is Hardware Acceleration Important in Video Processing? * Transcode, resize, download and record 4K video at Intel/Nvidia/AMD 5X faster speed. * Change 4K x265 video frame rate, aspect ratio, resolution for faster uploading to SNS. * Edit 4K video (cut, trim, crop, add subtitle) on GPU, no burden to CPU. How Does Hardware Acceleration Work to Boost 4K UHD Video Processing? The switch of modern videos towards higher quality resolutions increases the burden on CPU, which leads to CPU overheating, laptop lagging, high CPU usage, frozen operations and battery suffers. Hardware acceleration, by exploiting GPU's massive parallel processing power, turns out to be the most efficient solution to cut time and energy consumptions. Particularly, hardware acceleration solutions let 4K ultra HD HEVC H.265, HD H.264 video processing go far beyond the traditional CPU-in efficiency. 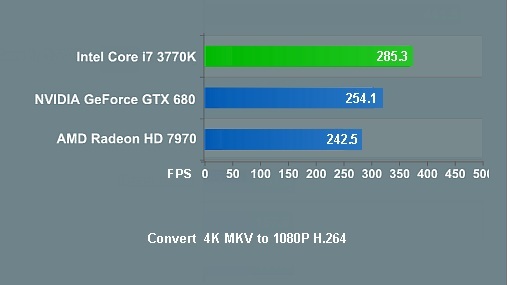 For example, if the computer is equipped with Maxwell-based Nvidia graphics card from the GeForce 900 series or later, Nvidia hardware encoder can take care of the 4K HEVC processing and go 2-3x faster than using Handbrake. The HW accelerated speed doesn't end yet. 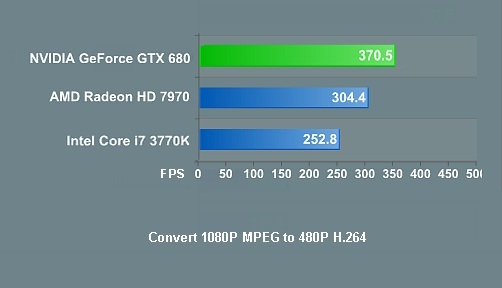 GPU's high video processing performance is further proven by MacX Video Converter Pro's unique 3-Level Hardware Acceleration (HWEnc, HWDec & HW processing), which offers a 5x faster speed up over HWEnc-only tools, let alone other SW-based programs. It's time to look deeper into the role that hardware acceleration plays in HD video processing. Part 1: What is Hardware Acceleration? Part 2: Why HW Accel is Important for 4K Video Processing? Part 3: Which GPU Acceleration Yields Better Result? Broadly speaking, all the speed boosts achieved in video processing via hardware upgrade are referred to as hardware acceleration. The common ways that are usually used to accelerate the video processing include replacing the hard disk, increasing the memory, and utilizing more CPU cores... Strictly speaking, it means using GPU's powerful graphics capability to do the video transcoding. Specifically, in video transcoding, graphically-intensive tasks such as high-definition video processing are offloaded from CPU to specialized GPU/APU, which is more efficient than doing it only on CPU. Software acceleration is used to describe the process of optimizing a program by the means of built-in code optimization, algorithm upgrade, performance improvement, or other techniques to speed up the program for video decoding and encoding. Basically, it still utilizes system resources and increases CPU burden. In contrast, hardware acceleration is to make the most use of the dedicated graphics cards or integrated graphics based on Intel QSV, Nvidia or AMD hardware acceleration solutions. Hardware acceleration, by contrast, is far less CPU occupied and will dramatically reduce the waiting time for video processing, especially for 4K UHD and compute-intensive HEVC files. Applications that support GPU hardware acceleration on the market include: Windows Media Player, VLC Media Player, Handbrake, MacX Video Converter Pro, MediaCoder, PowerDirector, Movavi Video Converter, Wondershare Video Converter Ultimate and Any Video Converter Ultimate. You have already known what hardware acceleration is, yet you might be still unclear about the reasons why hardware acceleration improves video processing speed via offloading compute-intensive tasks to GPU instead of the general-purpose CPU. It doesn't matter. After you understand the basic architectures and features of CPU and GPU, you'll be suddenly enlightened. From the architecture picture, it's clear to see that plenty of space is occupied by cache in CPU and the rest space is filled with powerful ALUs and complicated control logic, which are designed to handle operation latency, branch prediction and data forwarding. Comparatively, GPU adopts energy efficient ALUs and overlong pipelines with very simple control logic and almost omitted cache for high throughput, no branch prediction or data forwarding abilities. Thus, faced with a high-demanding task, CPU has sophisticated logic control to reduce latency via branch prediction and data forwarding to quickly response and perform up to 64-bit double-precision floating point instructions while GPU lacks that ability. Generally, a CPU chip only covers a few cores for sequential serial processing while a GPU chip contains thousands of cores (or threads) to handle parallel workload or matrix computation. And basically computers decode and encode most video codecs like HEVC, H264, MPEG-4, VP9, etc. based on multi-cores and hyper threads. Therefore, when it comes to float-point computation or large-scale concurrent operations like 4K video processing, video decoding/encoding, GPU has built-in advantage, able to parallel process large-sized video transcoding data based on thousands of threads, much faster than CPU. That's why GPU hardware acceleration is widely used in video processing, decoding and encoding. Hardware acceleration transforms what used to be a time-consuming chore into something you can finish at 2-3X faster speed. How does it get that way? The following HW acceleration workflow will enlighten you on this matter. 1). The first step is the separation process of compressed video data, which is conducted by CPU. GPU and APU don't involve. 2). CPU hands over the compressed video and audio data to GPU and APU and the file data is transferred from system memory to graphic memory. 3). GPU and APU begin to hardware decode video data and save the decompressed file data on graphic memory. Basically, CPU is in idle status if the workload doesn't exceed GPU capability. Of course, CPU would check the processing performance now and then. 4). GPU and APU use their own circuits to decode video data (still saved on graphic memory). 5). The post-processing task is also accomplished by GPU and APU like de-interlace, 3:2pulldown, Doppler effect, etc. CPU still has little participation. 6). GPU informs CPU after the media data processing is finished. CPU receives the rest of the task and begins to handle the video output process. Hardware acceleration is widely used in 4K Ultra HD video processing, video decoding & encoding, large file compression, video playback (especially high-def videos), online video streaming, web browser data loading, 2D/3D games, HEVC H.265 transcoding etc. You can find it almost everywhere. Why is it so popular? Any advantages of hardware acceleration that you can't resist? Actually, yes. And it has more than one strength. As is known to all, video processing involves large-scale computing tasks, most of which actually are repetitive and don't have much logical relationship. To put it in another way, video processing mainly relies on parallel operation. That's what GPU is skilled in. GPU is built-in with SIMD architecture, abbreviation of Single Instruction Multiple Data, filled to brim with thousands of cores to carry out the same instruction at the same time. Consequently, when GPU hardware acceleration tech is utilized in 4K video processing, transcoding, editing, resizing and playing, the whole process will be dramatically improved at speed. How much faster can hardware acceleration facilitate in 4K UHD video processing? It would be much clearer by using the specific example, e.g., Intel Quick Sync Video hardware acceleration. Assisted by the on-chip Intel® UHD Graphics 630 chip up to 1.20 GHz dynamic frequency and 60GHz 4K support, the 8th Generation Intel® Core™ i7 Processor (activated by software MacX Video Converter Pro) can hardware accelerate 4K 2160p (AVC) camcorder video to H264 conversion from avg 80 FPS to avg 270FPS, 3-5X faster than that only on CPU. To put it simply, hardware acceleration can turn what used to be a time-consuming chore into a task that you can accomplish with only 1/3 or 1/5 time. Without the help of GPU hardware accelerated decoding and encoding, processing videos especially HD, 4K Ultra HD videos or 3D contents will place a heavy burden on CPU. To process intensive videos smoothly, CPU has to try very hard, generally 350% usage for i5 processor and 570% for i7 processor. When CPU has been eaten up, it in turn causes CPU overheating and lags in response. Using GPU hardware accelerated video processing tool like MacX Video Converter Pro is a different story. It's able to hardware decode, encode and process 4K Ultra HD video mainly on GPU processor instead of CPU via Intel QSV, Nvidia and AMD APP level-3 hardware acceleration techs. Thus, the used CPU usage of 4K video processing can be reduced from 350% to 280%, 570% to 430%, more CPU utilization saved for smooth multi-tasking, like web browsing, video game playing, etc. It would be much more acceptable for your CPU to handble 4K H264 video processing like 4K H264 video transcoding or editing. Yet, when it comes to deal with 4K HEVC video processing, your CPU processor can't get away from the overheating issue. Cuz the better coding effeciency of 4K HEVC comes at the price of increased computation complexity, 10X more compute power needed than 4K H264. Therefore, it stands a high chance to encounter the CPU overheating trouble during 4K HEVC video processing, especially 4K HEVC GoPro video editing. If the CPU temperature reaches 90°C or higher, it might be something wrong with your throttling, which could ruin your CPU within months to a year. Fortunately, GPU hardware acceleration comes to rescue your CPU processor by assigning heavy task from CPU to GPU processor to cope with the compute-intensive yet parallel-oriented task. Thus, your CPU overheating problem can be easily tackled. Generally, video processing speed is inversely proportional to video quality. That happens when the video converter uses its built-in conversion algorithm to ditch away some unnecessary and less important file data during processing to reduce file data and then accelerate conversion speed. Yet, things are different to hardware acceleration, which makes full use of your computer hardware configurations (CPU & GPU processors) to give a great boost on video processing speed, zero damage on your video quality. • Intel® Quick Sync Video: this hardware decoding and encoding tech can be activated to use in video processing as long as the computer is equipped with 1st-6th generation Intel® Core™ i3/i5/i7 processor and Intel® HD graphics GPU or Intel® Iris™ graphics GPU. That's to say, majority of the current computers satisfy the basic conditions, no matter the computer sports with integrated graphics or discrete graphics card. • Nvidia: as for the most common H264 video decoding and encoding, the computer armed with the 1st generation Kepler (Quadro K420) and GK107 chip sports with Nvidia hardware acceleration technology, no more demands on the quantity of Nvidia chip. In respect to HEVC (H265) video processing, higher demands are needed, at least Maxwell (2nd Gen) with Quadro M4000 and GM204 ship. More importantly, 2 NVENC chips should be installed. In most cases, there is no problem for your computer to hardware decoding and encoding H264 video. Just properly upgrade your hardware configurations when hardware encoding HEVC files. Hardware acceleration has the dedicated module and unit to handle video esp. large-sized 4K video processing, which maximizes fixed functions for Cydn reduction and makes video transcoding no longer confine to desktop. It's similar to high-rise elevator. High-rise elevator can help you directly reach the top floor (e.g., 40/F) like a cork without climbing the floors, much power saved. The ordinary stairs can send you to the top floor, as well, but you have to go through each floor, which consumes much more energy and time than high-rise elevator. No wonder the majority of computers and software feature GPU hardware acceleration to provide users with faster and better user experience in video processing. Part 3: Which HW Acceleration Yields Better Result? Intel Quick Sync Video, one of the most commonly used hardware acceleration techs, takes full advantage of dedicated media capabilities of GPU on Processor Graphics to improve video decoding and encoding speed up to 2-3X real time faster. This hardware encoding tech is available if you're running on a 2nd-7th generation Intel® Core™ i3/i5/i7 processor with at least Intel® HD graphics GPU or Intel® Iris™ graphics GPU. Besides, other underlining techniques on Processor Graphics also assist Intel QSV to further improve video processing speed, like Intel® Intru 3D Technology, Intel® Wireless Display, etc. Which CPUs Support QuickSync HW Acceleration? 4790K, 4790, 4790S, 4790T, 4785T, 4771, 4770..
With a view to properly control the text length, here we just list out the part of the specific CPU processor models. You're suggested to visit ark.intel website, where you can check if your computer CPU processor and processor graphics support Intel QSV hardware acceleration technology. Nvidia CUDA accelerates 4K Ultra HD video encoding speed by using the usual GPU rather than the general purpose CPU processor. Nvidia NVENC is a dedicated part of your GPU, which is designed to encode video only. That means NVENC won't participate in any other processing tasks if it's unrelated to video encoding. And the reason why NVENC quickly overshadows CUDA lies in that NVENC only has a little bit demands on bandwidth and memory and barely any demands on CPU/GPU. Nvidia NVDEC has a good partnership with NVENC, dedicated in video decoding to offload heavy computing burden from CPU. Which GPUs Support Nvidia HW Acceleration? To be specific, for NVENC hardware encoding H264 (AVCHD) YUV 4:2:0, you need to make sure that your GPU chip is at least Kepler (Quadro K420) with GK107 chip or higher. As for H264 (AVCHD) YUV 4:4:4/Lossless hardware transcoding, please upgrade your GPU to Maxwell (1st Gen) with Quadro K620 board and GM107 chip. Well, when it comes to HEVC (H265) 4K YUV 4:2:0 hardware video encoding, the entry level has higher demands: Maxwell (2nd Gen) GPU chip with Quadro M4000 board and GM204 chip. More importantly, you need to install at least 2 Nvidia NVENC graphics cards. To hardware decode H264, your GPU graphics card comes from Kepler family at least, with Quadro K2000 and GK107 chip. One NVDEC chip is enough. To hardware decode H265 (HEVC), Maxwell (GM206) with Quadro M2000 board and GM206 or higher should be guaranteed. Similarly, there is no more strict demand on the quantity of NVDEC chip. Only one NVDEC chip has enough power to do the H265 processing job. Of course, in case your computer supports to install more graphics cards, you can install another one to further boost HEVC video processing speed. For more detailed information, please have a check on NVENC Support Matrix on Nvidia official website. Note: generally, higher configurations, faster speed. GPU hardware encoding is highly related with your GPU configurations. You can't install multiple CPUs on your PC but you can install several discrete graphics cards up to 4 (based on your computer configuration) to dramatically improve big-sized 4K or 8K UHD video processing speed. Of course, it's not simply about the quantity of GPU cards but the high-level configurations of GPU graphic cards. AMD APP, the abbreviation of AMD Accelerated Parallel Processing, is a GPU hardware acceleration to give a great boost to 4K Ultra HD video quality and meanwhile accelerate software performance. Slightly different from the above Intel QSV and Nvidia, AMD APP makes both CPU and GPU sincerely cooperate with each other to jointly improve various applications processing speed. For this point, CPU usage is seemingly higher than the previous QuickSync and Nvidia. Of course, this is also connected with the workload. Note: All the tablets above are provided for your reference only. You're suggested to go to Intel, Nvidia or AMD official website to check the detailed CPU or GPU information if your CPU/GPU version isn't found here. 4. Which Performs Best: Intel, AMD or Nvidia? Intel QSV, AMD APP and NVIDIA also differ slightly in video processing. To make clear the video transcoding performance of hardware acceleration technologies, below we will put them onto a set of transcoding tests. 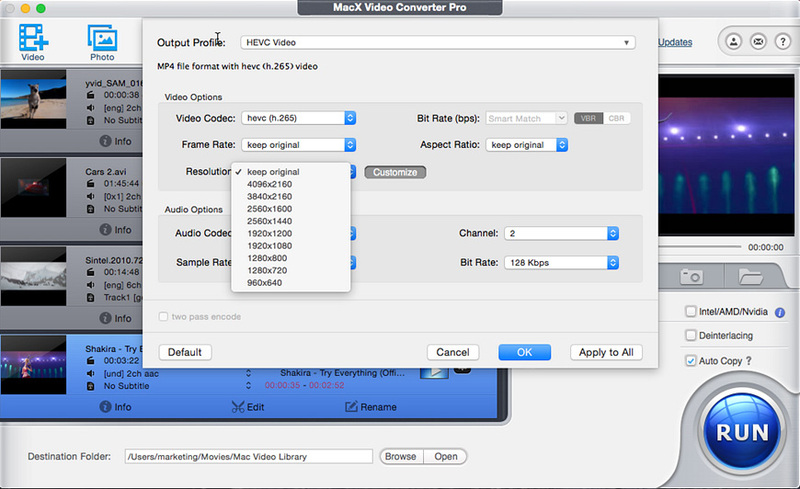 Test program: MacX Video Converter Pro. It's a program especially designed for digital video processing of rich video sources, covering all types of video processing like video decoding & encoding, super-resolution compression, hardware acceleration, content editing, screen motions capturing, and more. It supports Intel/AMD/NVIDIA hardware acceleration solutions. • There are around 2 to 3x speed improvements using the three hardware acceleration technologies. However, the encoding speed varies dealing with different videos: when transcoding 720P video, NVIDIA and AMD are faster; when processing 2046p video, Intel QSV has a slight speed advantage. • NVENC performs equally well to Quick Sync when encoding at a high resolution, say full HD. But when higher compression ratios are implemented on encoding for lower-quality outputs, like 1080p to 640p, Intel Quick Sync quickly surpasses NVIDIA. • As for the effect on device energy, a faster computer battery drain is observed during NVIDIA encoding. To explain it clearly, here the results from an early test carried out by Hardware.fr will be used. According to the test, Intel hardware transcode engine is more energy efficient than NVIDIA, with an avg. power consumption of 0.83w/h vs 3.2w/h. • AMD now shows a notable quality improvement than that with AVIVO. Here the AMD's color saturation plays a more significant role to make the scene look brighter. But brightness may easily wash out details, which used to be a common problem of AMD when the brightness changes significantly. • Intel and NVIDIA's motion compensation algorithms do a better job in delivering more details. While there is minor graininess observed in the grass on the left corner in AMD picture, there is almost no aliasing around the shapes and less blurred backgrounds in latter two images. • While it's hard to tell the quality differences between Intel and NVIDIA by human eyes, there are some measurements to help. The Hardware.fr tests have recorded that differences based on PSNR and SSIM. Indicated in the results, Quick Sync scored higher in both PSNR and SSIM benchmarks than NVIDIA did. Apparently, Intel Quick Sync is way better than NVIDIA NVENC in quality at the same amount of CPU load. Conclusion: All the three hardware acceleration solutions can deliver a 2 to 3x speed boost. The differences in the video transcoding efficiency are mainly determined by the source video. 1. When the source video is within the processing capability of GPU, NVIDIA and AMD are faster than Intel QSV. 2. When the source video is too big, like large 4K Ultra HD or 3D videos, then Intel QSV shows a slight ascendant than the two others. Part 4: Which Level of HW Acceleration Does Your Software Reach? Currently, there are sheer number of programs offering support to hardware acceleration, including Handbrake, MacX Video Converter Pro, Movavi Video Converter, Wondershare Video Converter Ultimate, Any Video Converter Ultimate and many others. Yet, they are not created equally. Some might only have the ability to access hardware encoding (aka. Level-1), some are armed with hardware decoding/encoding (aka. Level-2) and others reach new height - Level-3 hardware acceleration (HWDec, processing & HWEnc). Well, Here come the questions - which level of HW acceleration is better and which one supports Level-3 HW acceleration? Check below to find the answer that you want. What is Level-3 Hardware Acceleration? Video encoding is a processor-intensive procedure. It will consume 90% or even higher CPU power if it relies on software encoding. To relieve CPU from the burdensome video encoding task, hardware encoding is the key, which is why majority of software features hardware encoding to improve HD video encoding, esp. 4K 8K Ultra HD video encoding speed. After the video is decoded by the software, Intel Quick Sync, NVIDIA and AMD hardware encoders, namely dedicated processors in GPU, activate GPU hardware acceleration capability of your computer to handle 4K 8K HEVC/H264 video encoding task on powerful GPU card instead of CPU processor. Most hardware-accelerated tools on the market support hardware encoding. HW decoders shift the decoding from CPU to GPU based on the video codec, graphic cards and operating system. HW decoder generates faster speed and better battery mileage than even the most efficient SW decoders which require more CPU horsepower to offer the same video quality & smoothness. Currently, most of the accelerated programs in the industry fail to get to Level 2. Besides the hardware acceleration in video decoding and encoding, the software can also let the graphic card perform video editing, compressing and resizing of the decoded video. By far, 99% progams fail to offer support for Level-3 Hardware Acceleration. MacX Video Converter Pro is the only Level 3-capable video processing tool that implements a complete pure GPU hardware transcoding process. In comparison, its speed is 5x faster than the closest competitor. Some, if not all, might be curious about the procedure of how Level-3 hardware acceleration speeds up 4K video processing (esp. 4K HEVC) up to 5X faster. The pure text description is nowhere near as intuitive as its workflow. Let's begin with the 3-Level accelerated 4K video transcoding workflow to illustrate for you. Step 1. Free download the unique Level-3 4K video processing tool - MacX Video Converter Pro. Afterwards, fire it up on your computer. You can see the Hardware Encoder "Intel/AMD/Nvidia" option will automatically be ticked if your computer supports one of these HW acceleration techs. This also means the GPU acceleration tech is activated by this program. Step 2. Import your 4K video source and then this GPU accelerated video processing software starts running to read and extract the individual elementary streams like 4K video, audio and subtitles from the raw data via a process called demux. Then the separate data will be sent to the system memory. This step is very fast and will keep the original quality. Step 3. With the support for Level-3 Hardware Acceleration, the software transfers the compressed video streams to CPU and CPU offloads these tasks to GPU processor. GPU takes a compressed bitstream as input and converts it to digital components video as output for post-processing. This step is done by hardware GPU, thus called HWDec. Step 4: The GPU keeps working. GPU contains comprises graphics, video, audio, and display capabilities to further process the video like remove the nosie, scale dimensions, sharpen, transcode the bit rates, frame rates, etc. Step 5: GPU encoder now encodes the uncompressed digital video to a new track, namely HWEnc. The most resource- and time-intensive processes in video transcoding are all done by GPU, during which the CPU is freed up to provide sufficient compute capability for gaming or other tasks on computer. 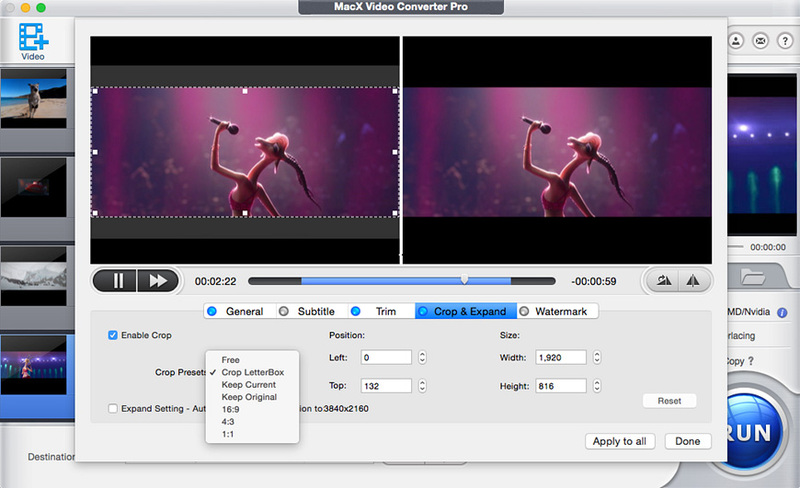 Step 6: After the GPU video transcoder finishes, GPU sends the results back to MacX Video Converter Pro. Then the software will combine the 4K video, audio and subtitle component files and multiplex them into a new container file which can be read and distributed by common players, programs and devices. * Trim: tap "Trim" option at the video info bar to remove unnecessary video clips from your 4K video to control your 4K video length at your willing. * Crop: enable "Crop" and the marquee will appear to let you freely adjust video image width and height to get rid of black bars from video and change video aspect ratio to 4:3, 16:9, 1:1, 17:9, etc. to better fit your 4K video playback device screen. * Subtitle: for those movies that lack subtitles or are built-in with foreign language subtitles, you can click "Subtitle" to add external srt subtitles to your 4K movies or videos. And don't worry about the video subtitle out of sync issue, for this 4K video converter can automatically sync subtitles with video. * Merge: opt for "Merge" to merge two or even more video footages into one, which is especially useful for you to combine TV episodes into one video and merge several funny clips into a new one for SNS uploading & sharing. * Rotate: some 4K videos are recorded by your iPhone or Android in a vertical direction while you wanna playback it in a horizontal direction on another bigger screen. It's easily tackled by using "Rotate" feature to turn your vertical video to horizontal video. And it also empowers you to flip your 4K video upside down, as well as rotate video 90/180/270 degrees. More bonus features are provided by this HW accelerated 4K video processing tool, for instance: split, video to GIF conversion, mirror & Flip, transcode video to M3U8, export subtitles from video, extract snapchat from video and more. Only a simple click is needed to apply them to your video. Just do as you wish. When everything is ready, tap "RUN" button and this HW accelerated 4K video processing software will begin to process 4K video editing task grounded on GPU hardware acceleration techs (Intel/Nvidia/AMD). Thus, the whole 4K video editing mission is delivered from CPU to GPU processor. Since GPU is designed with an architecture of SIMD (Single Instruction Multiple Data), it has hundreds of cores to handle the same instruction at the same time. The 4K video editing just happens to be this kind, parallel computing. Therefore, when the compute-intensive 4K video editing mission is handed over to GPU, GPU can make full use of its efficient yet heavily pipelined ALUs to deal with the 4K video editing task at high throughput. Time is saved and 4K video editing laggy problem is fixed, as well. The above illustration covers three parts of hardware acceleration: HW decoding, HW video processing and HW encoding. It's understandable for most users about hardware decoding and encoding. Yet, it's comparatively strange to you about HW video processing. Actually, video processing is responsible for handling video compression, video editing, resizing, playing, etc. Well, how does HW acceleration affect 4K video processing speed? Here you'll be enlightened by 4K video compressing and editing. Now, let's cut to the chase: GPU acceleration in 4K video shrinking. Step 1: After the 4K video hardware decoding is finished, you can choose the output format from the pop-up window. Honestly, HEVC is a great option, 64% less bit rates than H264. Of course, the higher coding effeciency of HEVC comes at the cost of a little bit worse compatibility than H264. Beyond them, FLV, WMV and 3GP are also suitable for you with better compression ratio in video codec. Of course, the output quality is affected, loss at a certain degree. Step 2: To further reduce 4K video size, tap "Settings" icon at MacX Video Converter Pro's home screen and you'll be directed to the parameter adjustment window, where you're allowed to lower 4K to 1080p, change frame rate from 120FPS to 60FPS, 60FPS to 30FPS and downgrade bit rate to downsize 4K video. Step 3: To losslessly shrink 4K Ultra HD video, opt for the scissor-shaped edit icon to utilize "Trim" and "Crop" features to resize 4K. Enable "Trim" to freely set up the video start time and end time to shorten video length. Activate "Crop" feature to adjust video image width and height and remove black bars from video. These operations have no impact on your video quality. > The built-in intra-frame and inter-frame prediction will be activated to do the block transform work. Considering both intra-frame and inter-frame prediction are typically matrix operations, they	can be hardware accelerated by GPU processor (GPU excels in matrix operations). Thus, the removal of spatial and temporal redundancy can be accomplished at GPU accelerated speed, much faster than before on CPU. > The procedure of handling 4K video reduction also involves with DCT, Quantization and entropy coding, which used to place a heavy burden to CPU processor when hardware accelerated video processsing isn't available. Now, with the help of GPU accelerated video processing, the 4K file removal of perceptual and statistical redundancy can be even faster processed at powerful GPU processor (GPU is born for handling the tasks related with DCT). 1. What Does Hardware Acceleration Do for Video Processing? Hardware acceleration offloads graphics-intensive tasks like 4K Ultra HD video processing, from CPU to GPU for more effective video processing. 2. How Do I Enable/Disable Hardware Acceleration in Video Processing? Open Google Chrome, click the Options icon -- Settings > Advanced and turn on or turn off Use hardware acceleration when available. Open Firefox, press the Alt key, click Tools > Options > General, uncheck Use recommended performance settings under Performance section then you should see the option to enable or disable "Use hardware acceleration when available". Go to Safari > Preferences > Security and check or uncheck "Allow WebGL" under Web content tab. Click Tools > Internet Options > Advanced and check or uncheck "Use software rendering instead of GPU rendering". Go to Flash Player Help page, right click on the logo, click Settings then click the icon in the bottom-left corner and select or uncheck "Enable hardware acceleration" for video processing. 3. When Should I Use Hardware Acceleration? You can choose to turn on hardware acceleration when your devices need to do graphically intensive tasks like processing 4K UHD videos, encoding H.265 (HEVC) clips, playing 3D contents etc. Additionally, you have modern graphics card drivers, video cards, the latest version of applications to make sure you don't have compatibility issues. 4. When Should I Disable Hardware Acceleration? Hardware acceleration doesn't work well all the time. Here're the cases when you need to disable hardware acceleration. • You have strong CPU but weak or damaged hardware components, then hardware acceleration is properly low-performing. • Your computer has overheating issues or other problems after hardware acceleration is enabled. • You are experiencing poor performance of software and applications, for examples, programs don't run stably or crash. • You have other issues with hardware acceleration turned on when browsing, streaming or gaming. 5. Video Playback Issues with Hardware Acceleration? • Video playback is laggy or choppy or out of sync. • Videos are corrupted during playback, the screen turns green & purple or videos show up green and pink layers. • The graphics freeze or small dots of color are spattered across the screen. • Video doesn't play and there's a black or white box on the display and other problems. Sometimes hardware acceleration is not compatible with old graphics cards, so you may run into problems when playing (YouTube, Vimeo, Hulu etc.) videos using flash player on Chrome/Firefox or local videos on Mac/Windows. The common solution is to turn off hardware acceleration. 6. Why Doesn't GPU Acceleration Work? • The graphics card or video card is damaged or they are out of date. • Make sure you have Hardware Acceleration enabled. 7. Cannot Turn On Hardware Acceleration in AutoCAD? • Make sure you have hardware acceleration turned on. • Update to the latest video driver. • Reset AutoCAD to defaults. 8. How to Check If Chrome or Firefox Is Using Hardware Acceleration? In Chrome, type chrome: //gpu in the URL bar and check under Graphic Feature Status. In Firefox, type about:support, and check under Graphics section. Which HW Accelerated HEVC Video Encoder do You Prefer? How to Enable and Use Quick Sync Video Converter? Which is the No.1 Fast GPU Accelerated Video Converter? Does Handbrake Support GPU Acceleration or Not? How to transcode, edit and play 4K HEVC at accelerated speed. Learn how to edit video on Mac without lagging or stuttering. Download CUDA converter to convert video at accelerated speed. GPU Encoding or CPU Encoding: Which is Faster? GPU or CPU encoding? Read this post and then make decision.